The Alii Nui is a custom built, one-of-a-kind, luxury sailing catamaran. Measuring an impressive 65′ from stem to stern and 36′ port to starboard, it is truly the premiere sailing catamaran on Maui. The Alii Nui offers Snorkeling Adventures, Whale Watching in se ason (Dec-April) and awesome Sunset Cruises. You can also book a Private Charter. The Alii Nui frequents coral reefs abounding with sea life, including the green sea turtle, an endangered species. You can choose the trip to Turtle Point or, if you prefer, Molokini Crater. You can also participate in a guided “snorkel safari” with their trained water specialists. These trips include breakfast, a snack and lunch! All snorkeling equipment is provided complimentary, including optical masks and wet suits. There are also boogie boards with viewers and water noodles to use as flotation devices. Their friendly staff gives instruction that caters to individual needs and levels of experience. Once you’ve had your fill of snorkeling, you can enjoy a refreshing rinse-off shower with one of four heated fresh-water showers. The Alii Nui provides the ultimate in service and amenities, and they also limit the number of passengers. With small groups, plenty of deck space, and multiple trampolines (hammock-like lounging), there is ample room to kick-back and stretch out while basking under the warm rays of the Maui sun. However, if you prefer the shade, you’ll find plenty of seating under a spacious, covered cabin equipped with ample seating and tables. They also have easy access to the water from the bow and stern with crew helping you every step of the way. 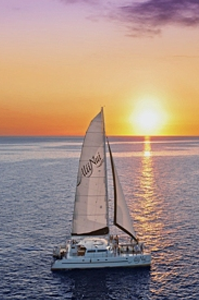 Their Sunset Sail, which includes delicious food and an open bar with imaginative drinks, is amazing and quite romantic. Be sure to try their homemade ginger ale made from fresh ginger puree! Quite a treat! Check them out online at AliiNuiMaui.com for a 10% online discount, or call them 808-875-0333.